Wine has had a long history of being served with just the right food. To help you take the guess work out of it we’ve matched up our Award Winning Wines with some of our favorite foods. Bon appetit! Smooth & bursting full of fruit, this light bodied wine derives its unique flavor from the Noble variety of Muscadine grape. A true balance of aromas with a refreshing aftertaste. Serve lightly chilled with rich desserts & cheese. Contains 6.0% residual sugar. A smooth flavorful distinct white wine that expresses cream aromas and full fruit. This wine finishes slightly sweet like the Muscadine grape. A perfect match with cheeses, fresh fruit and rich desserts. Contains 6.0% residual sugar. Rich in aroma and fruit flavor, this light crisp and refreshing wine embodies the radiant hue of a Florida sunset; a blend of different Muscadine grapes done in a blush style. Try it with a wide variety of finger foods, rice dishes and pasta. Contains 3.5% residual sugar. A skillful blend of traditional Florida Muscadine grape varieties offers up a delicate yet aromatic bouquet of fruit that finishes semi-dry to the senses. Popular pairing with shellfish, cream sauces and poultry. Contains 2.0% residual sugar. Lakeridge Winery`s Cabernet Sauvignon encompasses a medium bodied finish with rich deep color and a hint of oak – when served with rich marbled meats and Italian dishes this wine pairs perfectly. Lakeridge Winery & Vineyards’ Chardonnay offers a classically smooth and refreshing medium bodied white wine that is intended to pair with chicken, seafood or sharp cheese, or just sipping and relaxing. Crafted using the traditional METHODE CHAMPENOISE. This refreshing pink sparkling wine is wonderfully structured serving up lots of fruit, firm acidity and long aftertaste. A delight for special occasions or just relaxing. Try it with a rich dessert. Contains 5.0% residual sugar. A masterful blend of the Noble and Carlos varieties of the Muscadine grape; blended into a dessert-style table wine. You may notice an intense burst of delicious fruit on the palate. Enjoy it after dinner, sip slowly to savor the sweet richness of this exceptionally smooth wine. Contains 8.0% residual sugar. In bowl, mix together well wine, mustard, olive oil, honey and tarragon. Place chicken pieces in large glass baking dish. Sprinkle chicken with salt and pepper. Pour tarragon-mustard mixture over chicken; toss to coat. Let stand at room temperature 1 hour, turning occasionally. Prepare barbecue to 375F. 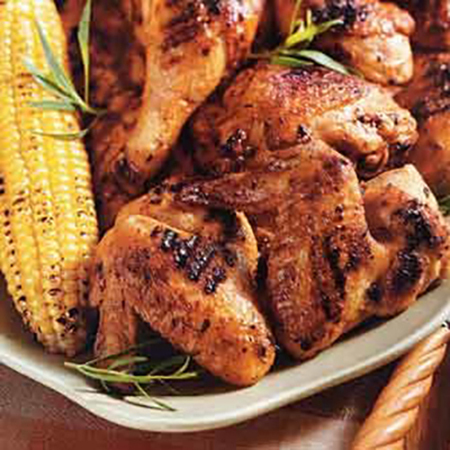 Place chicken on barbecue, cover and grill until chicken is cooked through, turning every 5 minutes and basting with prepared marinade, about 30 minutes. Serve chicken with seasonal vegetables and a glass of Lakeridge Chablis. Heat oil in a 12-inch heavy skillet over medium-high heat then cook shrimp and garlic with oregano, red pepper flakes, turning once, until golden, about 2 minutes total. Stir in Pink Crescendo and tomatoes, scraping up any brown bits from bottom of skillet. Add cream and briskly simmer until sauce has thickened slightly, about 1 minute. Stir in lemon juice. Season with salt and pepper to taste. Meanwhile, cook capellini in a pasta pot of boiling salted water until al dente. 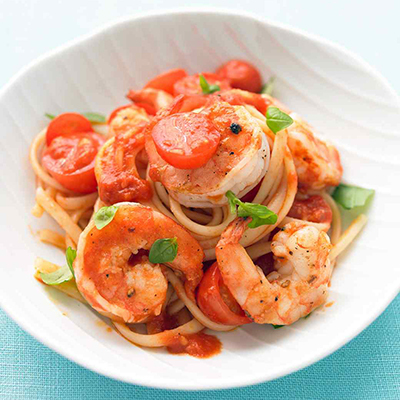 Spoon shrimp and sauce over pasta and serve with a glass of Lakeridge Sweet Crescendo. Place sun-dried tomatoes in food processor. Boil white wine, white wine vinegar, black peppercorns and bay leaf in heavy small saucepan until liquid is reduced to 6 tablespoons, about 8 minutes. Strain liquid into tomatoes in processor and puree until smooth. Return tomato mixture to same saucepan. Add whipping cream, chicken stock. Simmer until flavors blend, about 3 minutes. Meanwhile, Heat 3 tablespoons oil in heavy large skillet over medium heat. Add onion, carrot and celery and sauté until almost tender, about 5 minutes. Add thyme and lemon peel and stir 1 minute. Add beans, chicken stock and 2 tablespoons oil and toss until heated through, about 5 minutes. Season to taste with salt and pepper. Remove from heat. Cover to keep warm. Heat remaining 2 tablespoons oil in another heavy large skillet over medium-high heat. Sprinkle tuna with salt and pepper. Cook tuna to desired doneness, about 1 minute per side on high heat for medium. Spoon beans onto center of each of 4 plates, dividing equally among plates. Top each with tuna steak. 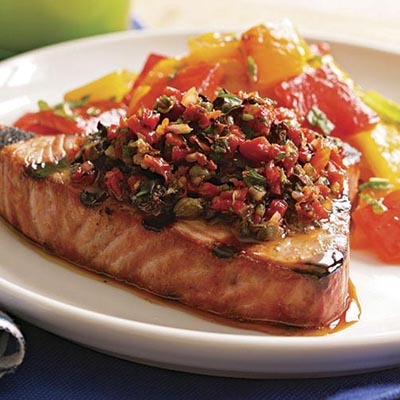 Spoon Tomato Sauce over tuna steaks and serve with a glass of Lakeridge Chardonnay. Boil wine, rosemary sprig, garlic, and red pepper flakes in a small heavy saucepan until reduced to about 1/2 cup, 7 to 8 minutes, add vinegar, honey, and chopped rosemary, then boil dressing until reduced to about 1/4 cup, 6 to 8 minutes. Prepare grill for cooking. Put bell peppers, zucchini, and onion on a lightly oiled grill rack and place over fire. Grill zucchini and onion, turning, until tender, 8 to 10 minutes, then transfer to a cutting board. Grill peppers until skins are blackened and flesh begins to soften, about 8 minutes, then transfer to a bowl, cover for 10 minutes. Season pork with salt and pepper. Grill on lightly oiled grill rack over medium-hot fire, turning frequently, until an instant-read thermometer inserted diagonally 2 inches into meat registers 155°F, about 20 minutes. Transfer to a cutting board, then tent loosely with foil and let stand 10 minutes before slicing. Toss vegetables with wine sauce, salt and pepper to taste. Toss arugula with remaining teaspoon oil. Mound grilled vegetables on 4 plates and top with sliced pork. Add any juices from cutting board to remaining sauce and drizzle over pork. Top with arugula and serve with a glass of Lakeridge Cabernet Sauvignon. Using melon baller, remove core from bottom end of pears. Combine Lakeridge Proprietor's Reserve, pear nectar and cinnamon stick in large pot. Scrape in seeds from vanilla bean; add bean. Bring to simmer. Add pears (liquid should cover pears halfway). 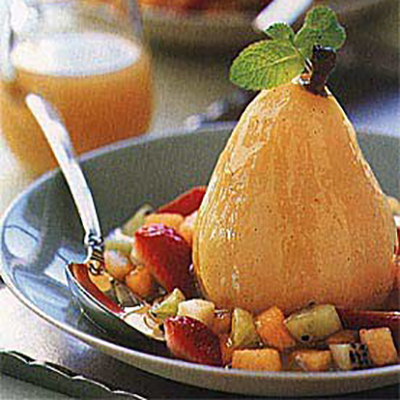 Reduce heat to medium-low; cook until pears are tender, about 10 minutes, turning pears halfway through. Transfer pears and cooking liquid to large bowl. Cool completely. Drain poaching liquid back into pot. Mix 2 tablespoons liquid with arrowroot in small bowl; return to pot. Boil until sauce thickens and is reduced to 2 cups, stirring occasionally, about 12 minutes. Cool sauce to room temperature. Spoon sauce into 6 shallow bowls. Place pears atop sauce. Sprinkle kiwi, cantaloupe and strawberries around pears. Garnish with mint and serve with a glass of Lakeridge Proprietor's Reserve. Cut orange segments into 1/8-inch pieces over a bowl; collect juice (about 1/3 cup); set orange segments aside. Whisk orange juice, Southern Red wine, pomegranate juice, 2 tablespoons of honey, oil, garlic and oregano in a bowl. 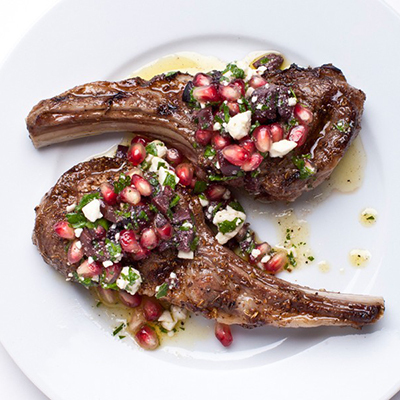 Arrange lamb in a 9" x 13" baking dish; pour marinade over lamb. Cover; chill 1 hour, turning once. To make relish combine orange, onion, mint, remaining 1 tablespoon honey and lemon juice in a bowl. Toss gently; chill. Heat grill pan to medium-high. 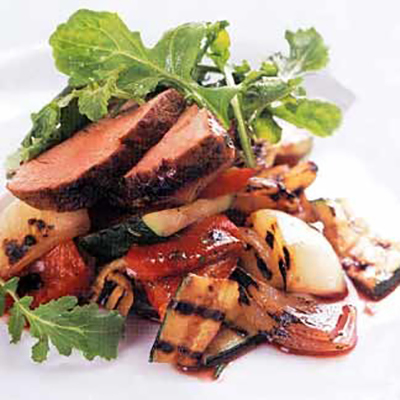 Remove lamb from dish, pat dry and grill to desired doneness (3 minutes per side for medium-rare). Let rest 1 to 2 minutes. Serve topped with relish and a glass of Lakeridge Southern Red. Mix salt, pepper, and 1/2 teaspoon allspice in small bowl. Rub spice mixture over both sides of chicken. Heat 1 tablespoon oil in skillet over medium- high heat. Saute chicken until cooked through, about 4 minutes per side. Transfer chicken to work surface. Tent with foil to keep warm. Add wine to each skillet and bring to boil, scraping up any browned bits. Combine wine and broth, lemon juice, and lemon peel. Boil until reduced to 1/2 cup, about 10 minutes. Whisk in shallots, thyme, 6 tablespoons oil, 2 tablespoons lemon juice, and 1/4 teaspoon allspice; season sauce with salt and pepper. 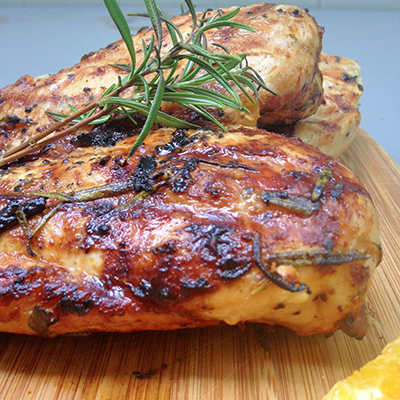 Cut chicken crosswise into 1/2-inch-thick slices. Divide chicken among plates. Spoon sauce over. Sprinkle with parsley and serve with a glass of Lakeridge Southern White. Sprinkle salmon with salt and pepper. Melt 1 tablespoon butter in medium skillet over medium-high heat. Add salmon; sauté until just opaque in center, about 4 minutes per side. Transfer to plate. Melt 1/2 tablespoon butter in same skillet. Add half of shallots and half of tarragon; sauté 30 seconds. Increase heat to high; add half of spinach and toss 30 seconds. Add remaining spinach; toss until wilted. Divide between plates. Melt remaining 1/2 tablespoon butter in same skillet over medium-high heat. Add remaining shallots and tarragon; sauté 30 seconds. Add Stove Reserve wine and cream and boil until sauce is thick enough to coat spoon, about 3 minutes. Season with salt and pepper. Return salmon to skillet; simmer 1 minute. 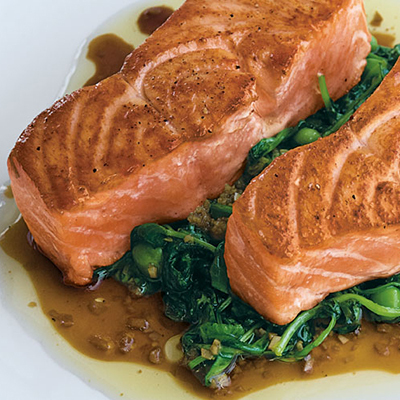 Arrange salmon with sauce atop spinach and serve with a glass of Lakeridge Stover Reserve. Heat oil in a 3-quart heavy saucepan over moderate heat until hot, then cook onion, garlic, and shallot, stirring occasionally, until golden, about 7 minutes. Add tomato paste, black pepper, cumin, hot pepper flakes, and 1/4 teaspoon salt and cook, stirring, 1 minute. Add bell pepper and tomato and cook, stirring occasionally, until softened, about 5 minutes. Stir in Sunblush wine, vinegar and simmer 1 minute. Stir in mustard, 1 1/2 cups cherries, and remaining 1/2 teaspoon salt and simmer 1 minute. Purée mixture until very smooth, about 1 minute and transfer sauce to a small bowl for glazing duck. Preheat oven to 450°F. Score duck skin in a crosshatch pattern and season with salt and pepper. Heat water in a heavy skillet, then add duck, skin side down. Cook duck, uncovered, over low heat, without turning, until most of fat is rendered and skin is golden brown, about 25 minutes. Transfer duck to a plate and discard all but 1 tablespoon fat from skillet. Brush duck all over with cherry sauce from bowl and return to skillet, skin side up. Roast duck in oven until thermometer registers 135°F about 8 minutes for medium- rare. Transfer duck to a cutting board and let stand loosely covered with foil, 10 minutes. Holding a sharp knife at a 45-degree angle, cut duck into slices. Serve with remaining cherry sauce, seasonal vegetables and a glass of Lakeridge Sunblush. Preheat oven to 450°F. Heat 2 tablespoons oil in heavy large skillet over medium-high heat. Add cipolline, carrots, celery, and garlic. Sprinkle with salt and pepper. Sauté until vegetables are lightly browned, about 8 minutes. Transfer to heavy large pot; push vegetables to sides. Heat 2 tablespoons oil in same skillet over medium-high heat. Sprinkle chicken generously with salt and pepper. Add to skillet and brown on all sides, turning often with wooden spoons, about 10 minutes. Place chicken, breast side up, in center of vegetable mixture in pot. 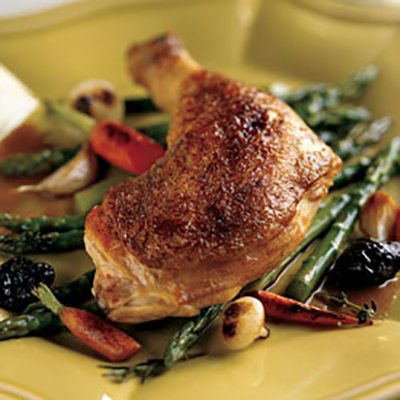 Arrange fresh herbs, lemon peel, and prunes around chicken. Tuck cabbage wedges around chicken. Pour off fat from skillet. Add broth and Lakeridge Blanc Du Bois Reserve to skillet and bring to boil, scraping up browned bits; pour over and around chicken. Drizzle remaining 1/2 cup oil over. Cover pot with large piece of heavy-duty aluminum foil, sealing tightly around rim. Place lid on pot to cover tightly. Roast chicken and vegetables until cooked through, about 55 minutes. Let stand covered 10 minutes. Transfer chicken to center of large shallow bowl. Using tongs, place vegetables and aromatics around chicken. Season pan juices to taste with salt and pepper; pour over chicken. Serve with a glass of Lakeridge Blanc Du Bois Reserve.